WTI Crude Futures prices are back at a $67 handle, tumbling 4% today following remarks from OPEC and Russia on the potential easing of output restrictions. 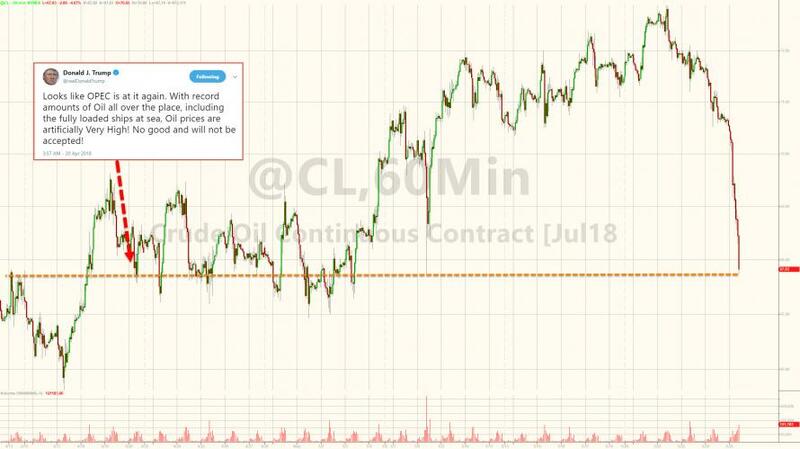 Just a month ago, President Trump tweeted that "oil prices are artificially Very High," blaming OPEC for the rise which was crushing the gains from his tax cuts and warning that this was "No good and will not be accepted!" Today, prices are plunging as OPEC (and Russia) confirm that they are likely to add to production output in H2 2018 as the possibility of Venezuela and Iran production constraints rise (due to sanctions). As we noted earlier, there are certain benefits when the president of the US is BFFs with the ruling Saudi regime, especially when the price of oil rises so high it threatens to not only undo the US president's tax reform, but to slowdown the overall economy even as said president is injecting a $1 trillion fiscal stimulus in it. We saw that in practice moments ago when Saudi energy minister Khalid Al-Falih said OPEC and Russia are prepared to adjust policy in June, and that it is likely that there will be a gradual oil supply boost in the second half. Furthermore, Russian President Putin just said that "$60 oil suits Russia fully" adding that "the future of the [OPEC/NOPEC deal] depends on the fate of the Iran nuclear pact."